In our ongoing review of commonly used ABIM Internal Medicine Board Review resources, we follow up our look at the Medical Knowmedge Self-Assessment Program (MKSAP) with analysis of Board Basics 3. The American College of Physicians (ACP) calls its Board Basics publication “An enhancement to MKSAP” and they are spot on. The ABIM board review summary, selling currently for $125 on Amazon (http://amzn.to/1djPUBw) or $99 on ACP’s website (http://bit.ly/1c3CQSu) condenses the highest-yield principles from the 11- book MKSAP 16 series into 342 easy-to-digest pages. Now in its third iteration, Board Basics is designed to be “Your Last Stop before the Boards.” Indeed, I would not attempt to use this reference without completing your primary ABIM preparation. You’re better off first doing an ABIM question bank like Knowmedge or MKSAP before cracking open this book or downloading the Board Basics mobile app. On the other hand, although I never tried it during residency, Board Basics may serve as a nice prep tool for the In-Training Exam if you choose to study for that annual assessment. There’s a lot to like with this book, as we’ll discuss below. The editor Dr. Douglas S. Paauw cites “84% of surveyed Board Basics 2 users (said) that Board Basics 2 effectively helped them prepare for the Certification or MOC exams.” A whopping 97% found it to be user-friendly. What was a bit surprising given these bits of encouraging data was that no more than 75% would recommend it to a colleague. Seems kind of mean, right, that you find a resource user-friendly and helpful in preparing for an exam…but decide to keep it a secret from your friends who happen to be studying for the same exam? 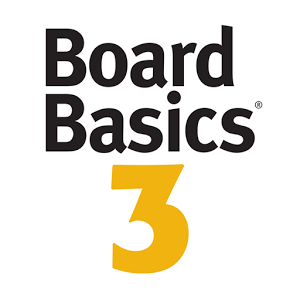 So what’s not to like about Board Basics 3? The most glaring omission is one that affects all disciplines: an index. The ACP managed to have indices at the back of each of the 11 books in the MKSAP boxed set. They even squeezed in size 8 font a separate comprehensive index, housed in its own booklet. But here in Board Basics 3, you flip past the final section—Women’s Health—and come across an Abbreviations section and that’s it. Granted, the table of contents is divided by diagnosis but it’s still not easy to navigate without an index, which surprisingly is lacking even in the app version. If you enjoy highlighting the textbooks you read, you’ll hate Board Basics’ Yellow highlighting feature, which “calls your attention to important phrases” the editor claims. I found this so-called tool to be highly distracting since I don’t really know what to make of the emphasized statements. Board Basics has already taken a ton of medical content and made it a manageable read. That’s great! But now ACP decides to make some of that condensed text even more abridged. Do I read back through Board Basics 3 a second time and focus just on the highlights? That’s how highlights are typically used. I’d rather not have to see this additional filter. Of course, you can find a different colored highlighter for what you personally want to review and then focus on that but the whole feature seems artificial and unnecessary. Lastly, a minor but still notable point: ACP explicitly states that Board Basics is to supplement MKSAP 16 which I definitely believe. But I scratched my head when I noticed that the separate books (or headers on the app) of MKSAP 16 don’t match up with the disciplines of Board Basics. Some of the topics of General Internal Medicine have been spun off. There’s a separate section for Allergy, Psychiatry, and Women’s Health and Oncology has been spun off from Hematology and Oncology. Board Basics is a popular study aid that has certainly played a role in helping tens of thousands of physicians become ABIM-certified. The “Don’t Be Tricked” call-outs, Study Tables, Images are engaging ways of breaking up the text and providing high-yield internal medicine board review tips. Whether or not Board Basics is “the best Board prep tool” as it claims to be is for you to decide. Jot down your comments below.